General Electric Catalog GEA-600A, published in 1930 by the General Electric Company, Schenectady, New York. It is quite unusual to find any items laid in to a book won on eBay, since nearly always the eBay seller has removed all loose materials. 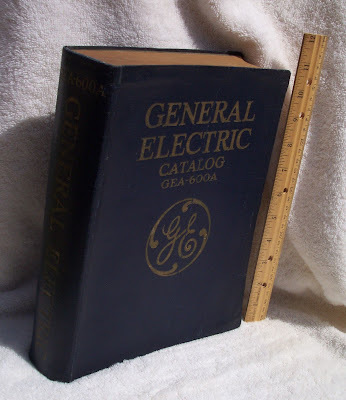 However, this book, which is a massive, 1146 page, catalog of industrial electrical items offered by the General Electric Company as of 1930, had one 8 ½” X 11” sheet of paper tucked between the last page and the inside back cover. Viola! A forgotten bookmark! 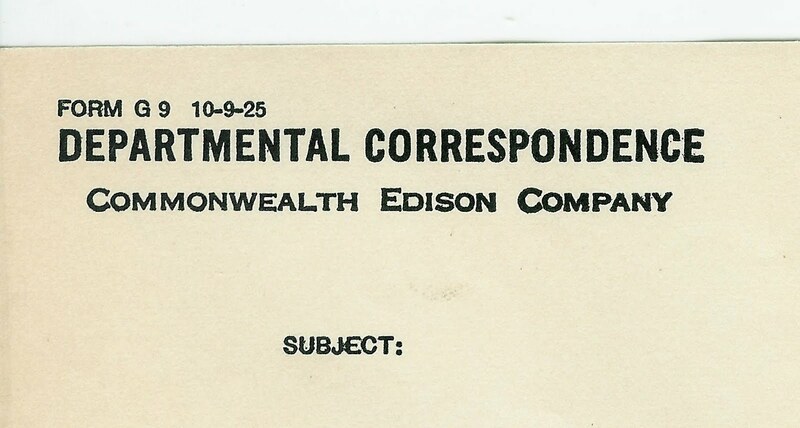 The front of the letterhead stationery is unused. The “10-9-25” indicates that stationery with this design (Form G 9) was approved on October 9, 1925, which establishes an earliest-possible date for any authored text found on that form. 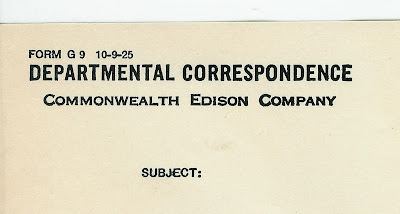 Since the date of publication of the G. E. Catalog is 1930, one can estimate the date of any written or typed text on the stationery to be somewhere in the 1925 to 1935 range. Power Supervisor--------------2 Rings – Horn. Operators will receive orders from any C. A. & E. employee or Elevated Railway employee to close or open the sections mentioned above. The Power Supervisor must be notified of any orders to close these sections and his approval obtained before sections are closed. Operators will get the name and position of the person giving such order and enter same in Daily Logbook. “L” Sections #25, 26 and C. A. & E. #27 and #28 are tied together at Laramie Tower during peak loads. Do not run Rotary #3 and #4 in parallel alone as they do not work good together; have another machine [turned] on with Rotaries #3 and #4, if possible. Report all operating trouble to Operating Division, and all maintenance trouble to Maintenance Division. If it is both kinds of trouble, report to both Divisions. After office hours, the Edison Telephone operator will know where members of the operating and maintenance can be reached. 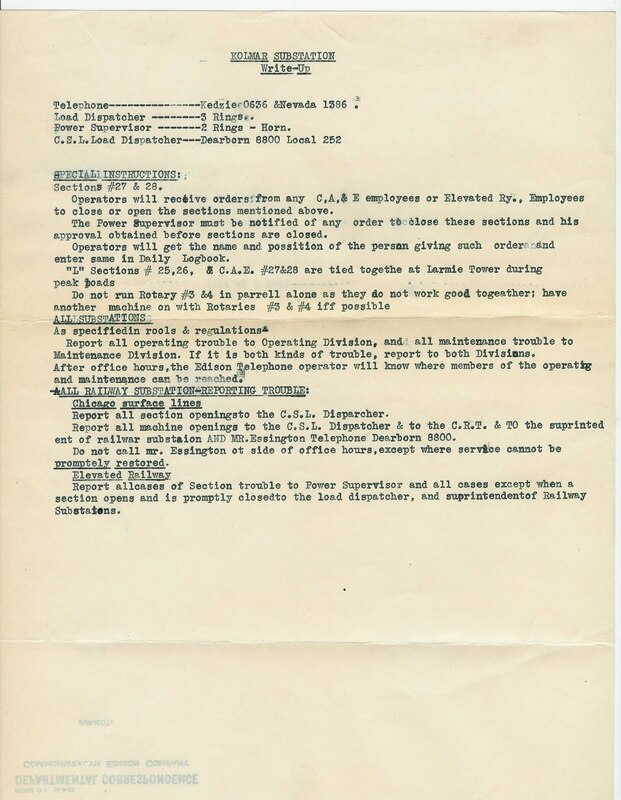 Report all section openings to the C. S. L. Dispatcher. 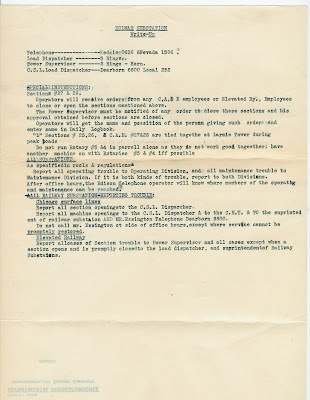 Report all machine openings to the C. S. L. Dispatcher and to the C. R. T., and to the superintendent of [the] railway substation AND Mr. Essington: Telephone Dearborn 8800. Do not call Mr. Essington outside of office hours, except where service cannot be promptly restored. Report all cases of Section trouble to Power Supervisor and all cases (except when a section opens and is promptly closed) to the load dispatcher, and [to the] superintendent of Railway Substations. Note: C. S. L. stands for Chicago Surface Lines. The inside front cover of the catalog is inscribed with the name (W. J. Pearce) and address of the owner, and also this information: Kolmar Substation: 616 S. Kolmar Avenue, Chicago, Commonwelth [sic] Edison. The misspelling of “Commonwealth” in the catalog inscription leads me to surmise that Mr. Pearce (assuming that “W. J.” is a male) is the person who typed the Kolmar Substation Write-Up, since it is laced with many typos and misspellings. A Mapquest search yielded some interesting information. The Eisenhower Expressway (which currently has the Chicago Transit Authority line running along its median) is located about a block south of 616 S. Kolmar Avenue, and a very large building still exists at that address, which is now the location of the Aries Charter Transportation Company. Leo, your thorough research makes me look like a lazy bum! Seriously, thanks so much. Fascinating material. Might "Do not disturb" be a secret of longevity? !